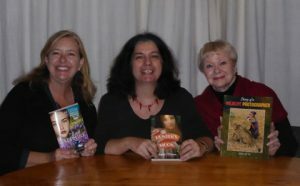 I have been so busy talking at schools and festivals, I have not had time to write about the wonderful Booked In Armidale Literary Festival, organised by Sophie Masson, CBC and NEWC. I stayed at the fabulous Lindsay House, and had a lovely room filled with beautiful antique furniture. Sonia gave me a tour of the town and I was impressed with the number of churches, the reason Armidale is called a city. Belinda Murrell arrived in the evening and we had a great pub dinner sitting by the fire. Walking back to Lindsay house was freezing but I thought of my cosy room and the handsome four poster bed waiting for me. In the morning a kind volunteer collected me and we arrived at the very impressive Armidale University. A technician helped me set up for the LiveLink video talk to outback schools. In the afternoon a talk at the Minimbah Aboriginal School. Jo Sherrin, the librarian, had been showing my animal videos to the children, so there was great excitement when I arrived. The children were wonderful and made me feel like a rock star. The next day another volunteer collected me and a long drive to Walcha Central School. The whole school came to listen to my presentation and watch the animal videos. In the afternoon St Mary’s Catholic Primary School with Year 5 and 6 students and they asked great questions after the presentation. Then Newling Public School with K to Year 4 students. A full and exciting day! A trip to Tamworth on the last school day and presentations at Timbumburi School. In the evening an exciting Shaun Tan exhibition opened by Sophie Masson. She gave a great speech. Horne and Trish Donald, the excellent MC. I flew back to Sydney the next day feeling happy. 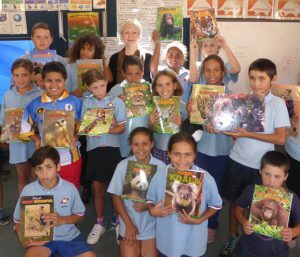 I hope I have inspired children to want to learn about endangered animals and help to protect them.